Saturday night is bean night! In Maine, back in the Bronze Age when I grew up, it was traditional to have Boston baked beans on Saturday night, and by this I mean every Saturday night. Now, there were families that just heated up a can of B&M, dumped some coleslaw from Shaw’s into a bowl, steamed up the brown bread and called it a night. Not mine. For us, baked beans represent serious tradition. Grammie Sue baked her own, as do my parents, and so do I. In the past, I have even made my own brown bread, but I cannot in good conscience urge you to do so; just buy the can. Making brown bread is a pain in the bean shoot. Why Saturday night?, I’ll bet you’re wondering. Well, I can only guess, but my hunch is that it has something to do with the Puritan mania for mortification of the flesh. Let me explain. 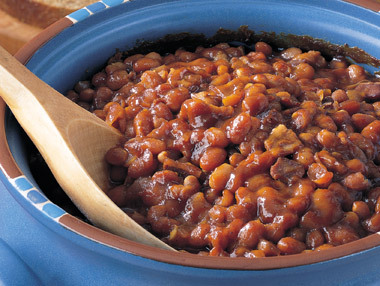 The tradition of Boston baked beans dates from colonial Boston. As we all know, eating beans can cause a certain amount of gastric distress. In my experience, the bout of flatulence that often follows a big bean binge can frequently persist well into the next day, in this case Sunday, and even the strongest of constitutions will have to work, and I mean really put your back into it, to suppress the truly offensive rumblings and odors that follow, as night does the day, repeated trips to the bean pot. Add to that the pressure of being in church when the rubber meets the road, so to speak, and you’ve got a recipe for some truly biblical suffering. Insiders know it’s best to choose either the front pew or the back one, depending on whether you prefer to avoid odor or detection. All that aside, I really like me some beans, especially in the fall. With a crockpot (which I refuse to call a slow cooker, despite recent rebranding) and this foolproof recipe from my friend, Karen, it couldn’t be simpler. I always use little navy beans, but New Englanders have strong opinions on the subject, and many prefer a larger bean, say a kidney bean or some such. Since this is my party, I’m going with the navy. You’ll also need salt pork, which I get from the butcher, but is readily available at the grocery store. I’ve included a picture in case you’re not familiar with it. So go on, give it a whirl. And while you’re at it, make your own coleslaw ferchrissakes. For vegetarians, my mother has this neat trick: Omit the salt pork and substitute ¼ cup of olive oil. Add a couple cloves of garlic (leave it whole or in big chunks so people know where it is), increase the salt to 2 tablespoons and add an extra onion. In this version, the tomato paste is a must. Rinse the beans and remove anything that looks weird. Dump the beans into a big pot and cover them with water. You should have at least an inch of water above the beans. Discard any floaters. Bring the beans to a boil then immediately reduce the heat to low and simmer them for 30 minutes. You cannot hurry this by boiling the everliving shite out of them. Doesn’t work that way. After 30 minutes, remove the beans from the burner and let them sit in the water for 1½ hours. Drain the beans, but keep the liquid. Combine all ingredients in the crockpot, then add enough reserved bean liquid to cover them with a quarter inch or so of liquid at the top. Stir it all around to combine, but don’t get crazy. It’ll all merge eventually. Hold on to the bean liquid! You may need to add more during cooking if it looks like the beans are drying out. Cook on low for 16-24 hours, depending on the size of the bean. You can start it out on high, then reduce the heat after a couple of hours to shorten the cooking time, or if you just like to frig around with the settings. I don’t. In my experience the tiny navy beans are cooked in less time, while bigger beans seem to need more. You can tell if they’re done by looking. They should be brown and bubbly. Now, I find that leaving the beans to sit around for a day or so really enhances the flavor, but you can just go ahead and serve ‘em up when they’re done cooking if you want. Posted on September 30, 2011, in Dinner and tagged Baked Beans, Bean, Humor/Commentary, Maine. Bookmark the permalink. 23 Comments. I get what you mean about old blogposts seeming new and fresh. the first two months of my blog I averaged zero readers, because WP stats are rounded down. I’ve recycled quite a lot and nobody noticed. Enjoy the holidays. Thanks, Duncan! Hope you’re in high summer, strawberries and cream heaven yourself. Not cream. Coarse freshly ground black pepper, maybe a squeeze of lime. Or freezer cold vodka. and black pepper. You’ll never have sugar and cream again. Works superbad with raspberries too, which I prefer to strawberries. I wondered what all that rumbling was at church. And here I was thinking that I was having a religious experience. Not sure what the difference is, but they need to be salty, no doubt. Also, my grandmother always warned against increasing the molasses at all — makes the beans come out hard. Have made beans and have tweaked the recipe to regulate gas output. A tad of garlic and really finely minced onions can increase the um, post-meal fragrances. Also, the lower and longer the simmer the more effective. 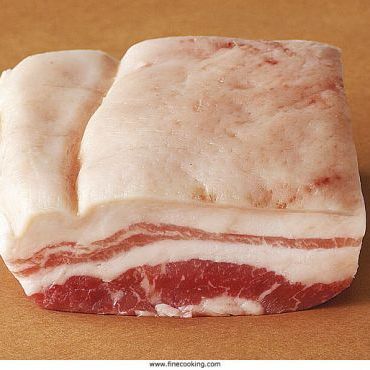 Oh and the salt pork should not be too lean, lean meat tends to reduce the gastric production. So you’re anti-Beano? That’s a bold stand, Tom. Potentially rancid, but bold. Nope, keep some on hand right along with the anti-diarrheals, At my age you never know. I’ve been told a pinch of baking soda in the beans while cooking takes the sting out of them, but so far it’s just hearsay. 1. Rinse the beans and remove anything that looks weird. I’ve just effectively banished myself from my kitchen. Didn’t know a recipe for beans could be so liberating. If you don’t eat it don’t cook it, as my Grammie used to say. Well folks, it’s vacation time, which means that instead of spending most of my time lolling around the portable bar, sipping one concoction or another, I plan on spending all my time in this pursuit for the next few weeks. As such, my output will likely be even thinner than usual. Luckily, like the sturdy ant in the parable about the grasshopper and the violin and some other stuff, I have squirreled away a large supply of posts over the past couple of years, and since viutally no one but my mother read my blog for the first year or so, they will no doubt seem fresh and new to most of you. If they don’t I suggest skipping the reread and joining me in a Bloody Mary or three. It’s the drink that eats like a meal, folks.